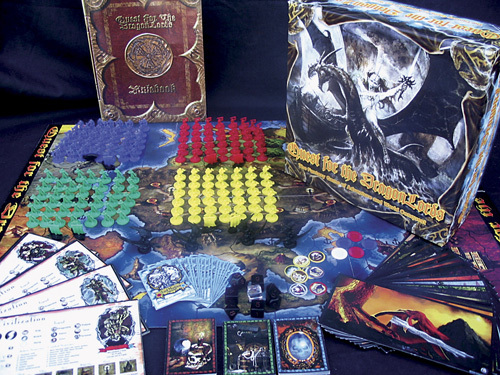 â€œQuest for the DragonLordsâ€�TM is a beautifully illustrated board game that pits player against player to conquer the known world. The basic game comes equipped with over 170 miniature Orcs, Dwarves, Elves, Barbarians, ships, and DragonLords. Also included is a CD-Rom rulebook with battle simulations. Each player as King of his realm must send warriors to the wastelands on a Quest for the DragonLords.TM The wastelands is a place of high adventure where danger awaits. May the Gods bless your Quest for the DragonLordsTM to lead your armies and fleets to victory. Other products in the "Quest for the DragonLords" series.